Part of Spain's vast empire in the New World, Honduras became an independent nation in 1821. After two and one-half decades of mostly military rule, a freely elected civilian government came to power in 1982. During the 1980s, Honduras proved a haven for anti-Sandinista contras fighting the Marxist Nicaraguan Government and an ally to Salvadoran Government forces fighting against leftist guerrillas. Honduras, one of the poorest countries in the Western Hemisphere, is banking on expanded trade privileges under the Enhanced Caribbean Basin Initiative and on debt relief under the Heavily Indebted Poor Countries (HIPC) initiative. While reconstruction from 1998's Hurricane Mitch is at an advanced stage, and the country has met most of its macroeconomic targets, it failed to meet the IMF's goals to liberalize its energy and telecommunications sectors. Economic growth has rebounded nicely since the hurricane and should continue in 2001. Honduran coffee is absent from the top ranks of the Speciality market for uncertain reasons. It has all the environmental factors on its side: soil, altitude, climate. 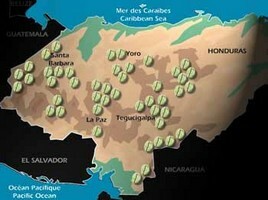 All it's neighbours have sophisticated coffee production: Guatemala, El Salvador and Nicaragua. But what is lacking is infrastructure, capital and a distinct "name" in the consumer market. This means that even a good quality Honduran does not fetch a good price (and in fact many from Copan and Santa Barbara districts are smuggled into Guatemala and sold as such). Without a premium price for quality, the incentive for the farmer, the miller and the exporter have no incentive to incur the added expense that would realize the coffee's potential. So Honduran coffee ends up as a good mild blender, and not as a single-origin or farm-specific coffee. It is, clearly, a vicious cycle.Coffee is processed through the towns of Marcala or Tegucigalpa. The largest growing region is Santa Barbara, followed by El Paraiso and Comayagua.